Born in Haifa Israel, and raised in both Israel and the United States, Rabbi Carmit Harari has served as rabbi of Shir Tikvah (formerly B’nai Yehuda Beth Sholom and Congregation Am Echad) since July, 2013. She is a graduate of the Solomon Schechter Day School in Skokie, IL, and was a camper at URJ Camp Olin Sang Ruby Union Institute (OSRUI), where she later served as a counselor, resident-director, and faculty member. As a high-school student, Rabbi Harari served as Religious and Cultural Vice President of her NFTY region: NFTY-No (then called NoFTY), and while in college, she was an active student-leader in Hillel: The Foundation for Jewish Campus Life. 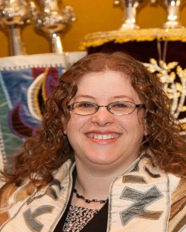 Rabbi Harari earned her undergraduate degree at the University of Minnesota in 1999, and was ordained at the Hebrew Union College – Jewish Institute of Religion in Cincinnati, OH, in 2008, where she also earned her Master of Arts degree in Hebrew Letters. Rabbi Harari loves Jewish music and prayer, and brings her passion for these elements to the services she leads. She sees her primary role as that of community builder, and she hopes to make Judaism meaningful and accessible to her community. Rabbi Harari enjoys the unique experience of serving a congregation that is affiliated with both the Conservative and the Reform movements. In her spare time, Rabbi Harari enjoys Israeli Folk Dancing, knitting, and reading.